Cook a Little, Talk a Little | Eat, eat, eat. Talk a lot, cook a little more. Cook a Little, Talk a Little Eat, eat, eat. Talk a lot, cook a little more. We have a lot of corn-on-the-cob in this house. The kids love it, but I tend to over-buy the ears at Costco. Today, listening to this interview on Fresh Air by two chefs I admire, I was inspired to turn a couple of those ears of corn into corn cakes. I looked at a few recipes and made something that worked great for our family. We served it as break-fast-for dinner with veggie sausages, blueberries and yogurt, but it also makes a great side dish for a more typical dinner. You can add chives or herbs, but I left ours plain for easier acceptance at the table by my children. Grate the corn on the large holes of a grater, or cut off the kernels and process in a mini-processor. Transfer to a medium bowl. Beat together grated corn, milk, egg and butter. In a small bowl, mix dry ingredients, plus cheese. Add to wet ingredients and mix to combine. Heat the griddle to medium and spray with canola or vegetable oil. 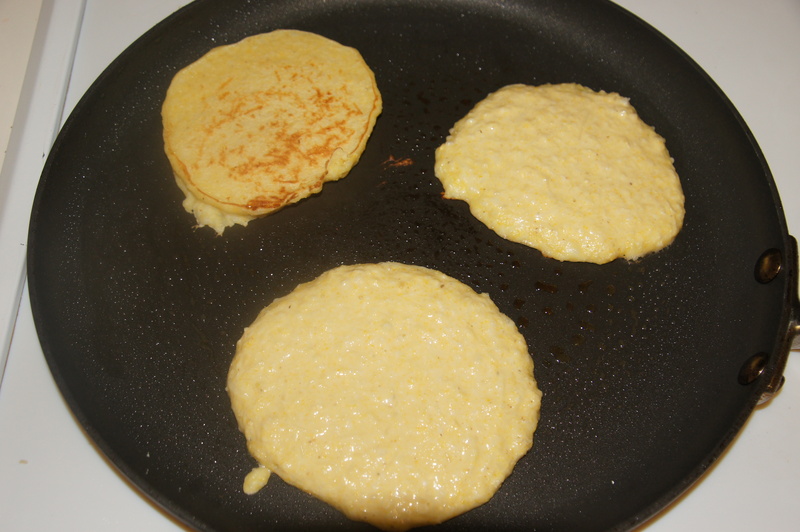 Cook as you would a pancake—about ¼ C mix on the griddle per cake, flipping when edges are cooked. I checked out a cookbook from the library on a friend’s recommendation—The Mom 100 Cookbook by Katie Workman—and one page immediately caught my attention. The Grilled Pizza recipe in the “Pizza and Pasta” section seemed too interesting to pass by untried. I have a pretty good gas grill, a garden full of tomatoes and basil, and pizza dough in the fridge (The recipe does include a section on making the dough, but I wanted to try out the quick-and-dirty version). The results? Tastes great, less pretty. 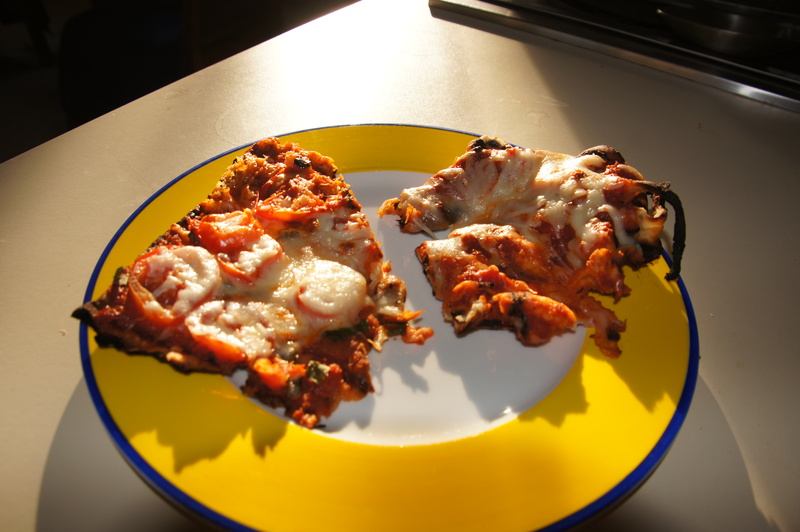 First, I made a grilled pizza for the kids that was basic sauce and cheese. While it was simple and quick to make, it looked hideous. The kids didn’t seem to care, though, since it tasted wonderful. Learning from the first pizza (always best to experiment on the under-developed palates first), I changed things up a bit for the tomato-basil Margherita version and it came out considerably more pizza-looking than the first. Here is the gist of what I learned: when using refrigerated pizza dough, do not separate it into halves and leave it in an oiled bowl for an hour as the recipe suggests. Roll it out with some flour, oil it, and throw it on the grill. Side note: The Mom 100 Cookbook is a good one, so far. I like the way Workman separates the sections by need—i.e., potluck, mixed company dinners, bake sale. It’s easy to navigate, and she calls out recipes for picky eaters and ways to bring the kids into the kitchen to help prepare the meal. Next time, I’ll either make the dough myself or buy a hunk from a nearby pizza place. But in a pinch, the pre-made stuff works fine. If you are hosting people this 4th of July, why not provide an alternative to burgers and dogs, especially for the vegetarians? After all, how many veggie patties can a person eat in one lifetime? Grilled pizza will, at the least, provide some additional conversation starters at your cook-out. Roll out pizza dough on a surface with flour. Stretch or pull it into a 12-inch rectangle or circle. You’ll need to give the dough some breaks in between stretches. It will puff up on the grill, so don’t worry if it’s only ¼-inch think or if there are holes in some parts. Pour tomato sauce into one bowl, cheese in another, and toppings in another. Bring bowls, oil, pastry brush and baking sheets with dough to the grill. Brush the top of the dough with oil. Swiftly pick up the dough and flip it, oil-side-down, onto the grill grate. Close the grill cover and wait 3 minutes. Once grill marks have formed, brush uncooked top side with oil and turn over the crust. Lower the heat to medium-low. Carefully brush surface with tomato sauce, sprinkle with cheese, and add toppings. Close the cover and cook for 4 minutes more. Once cheese is completely melted and crust is brown on the underside. Remove the pizza from the grill, sprinkle with fresh basil, and cut into pieces. What are your favorite vegetarian grill-out meals? Tell us what you are planning to cook for the 4th, and have a great holiday! I don’t know how I made it all these years without knowing about Monkey Bread, but I’m glad those days are over. My first introduction to this carbs-cinnamon-sugar-butter concoction was via Paula Deen (Natch). I borrowed one of her cooking-with-kids books from our local library last year, and one of the recipes my kids and I made was Monkey Bread. It made more than we could handle, and we brought some to the soccer team the next morning for an after-game snack and still had enough to bring to the baseball team that afternoon for the same purpose. So, as end-of-season sports parties are upon us, I made a batch for the Spitfire’s season-ender. 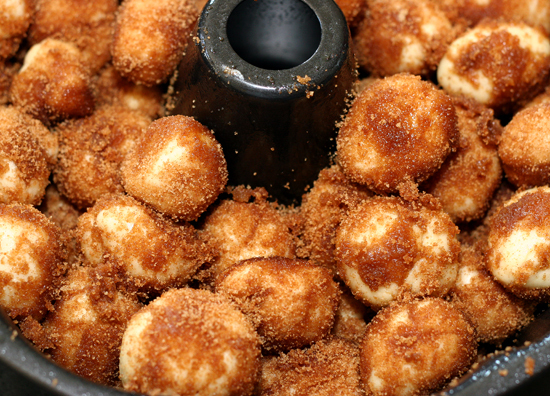 When the kids find out we’ve brought Monkey Bread we either receive blank stares or cries of “Yes! I love Monkey Bread!” from the assembled masses. Introducing kids to this treat is a real pleasure. 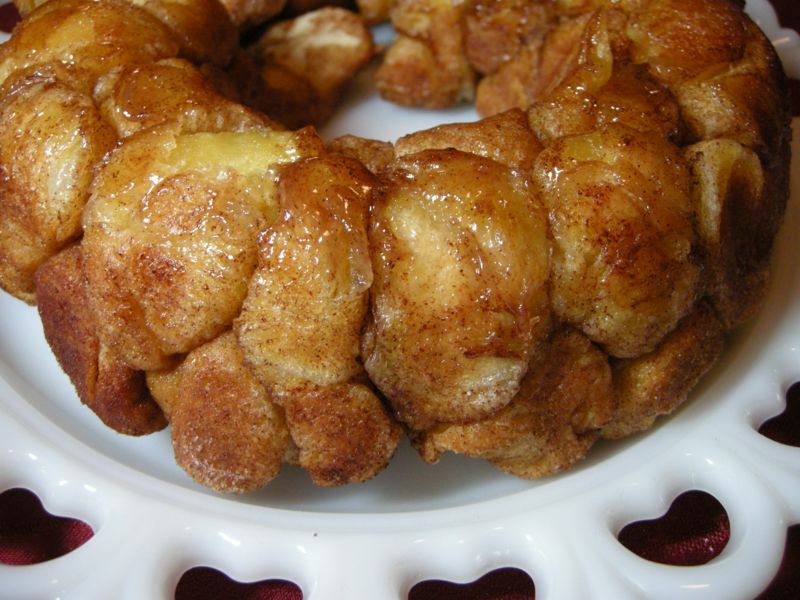 It works well for these functions because, while it looks like a lumpy cake, it is a pull-apart treat. And sure, there is sugar all over it, but’s less sugar-high-inducing than the usual cupcakes. As I mentioned, the Paula Deen version of this recipe made a lot—too much, for my taste. It was actually really hard to get it to bake evenly and I ended up splitting it into two dishes after the initial baking time, to finish it off uniformly. Most recipes call for 3 or 4 biscuit rolls, but using 2 cans of 8 should be enough for the usual kids gathering/potluck. We have another one this Sunday, and I’ll be making it again. It’s just so easy–to make, keep and serve. Coat a tubular cake pan with cooking spray or similar. Separate the biscuits and cut each one in ¼ pieces. Roll the pieces in the sugar mix to coat and drop each piece in the tube pan one-by-one. Continue layering until all the biscuit pieces are coated and in the pan. In a small saucepan, melt the butter and brown sugar over medium heat. Boil for 1 minute. Pour over the layered biscuits. Bake 35 minutes. Cool for 10 minutes, then turn it over to release the bread, and flip it again onto the final plate for serving. What do you make for a group of kids for these end-of-year parties? I know not everyone brings a dessert treat—what are some of your best recipes that go over well with this kind of crowd? No matter where you are in the world, if you are attending a Passover Seder this weekend there will be haroset. It is one of the foods with an honored place on the Seder plate, and well liked because of its role in limiting the spice/tears for the accompanying horseradish in the “Hillel Sandwich.” I don’t host a Seder in my home, but for the last dozen years I have been making the haroset for the seder my family and I do attend. I grew up eating a traditional Ashkenzi haroset, heavy on the apples and wine. This recipe for a more traditionally Sephardic haroset (derived from a Jewish Indian family) leans more on another fruit, the date, resulting in a thick, sweet matzo spread. We love it so much, I usually make another batch to keep at home. Even if you do not celebrate Passover, this dish is a great way to enjoy fruits, nuts and apples on a cracker. Adjust the cinnamon and wine to your own tastes. I haven’t made it yet this year, so I can’t post a photo. I’ll try to do so after the seder. Finely chop almonds in a food processor and remove to a large mixing bowl. Add the dates, wine and spices to the processor and grind until fairly smooth. Mix date mixture into bowl with almonds. Grate apple down to the core on the large holes of a grater and stir into the mixture. Add wine by the teaspoons if necessary to make sure mixture is spreadable but thick. Every year in March I take a good look at what I’ve been hiding under winter clothing and realize it’s time to get things back in order for the hot weather. For me, that means a lot of fruits and vegetables, and smoothies once or twice a day. For this blog, it means fewer recipes. There are a lot of salads and sautéed veggies happening in my house right now for me, and a lot of pasta and grilled chicken dinners. Not so interesting. It helps that I freeze pureed veggies in 2T portions to add to sauces and smoothies, etc. Last week I added spinach and cauliflower to turkey meatballs and it was a great way to lighten them up. Having it on hand means I am more likely to get creative and bring them into recipes. But I do think the smoothie is interesting. I’ve played around with this smoothie over the years and like to think I have it down to a fruit and veg art. Make it, drink it, let me know what you think! And if you are gluten-free (as is this recipe), the next post or two should be up your alley–Passover is coming and wheat is going out the door. Blend it all (I am partial to an immersion blender for smoothies), and add some ice if it needs it, or if you used fresh produce. The Amazing Grass tends to stick to the cup, so wash it out ASAP. This year, for the first time ever, we were prepared for Purim. And by we, I mean I. Each year I say I’ll make Hamentaschen or that we’ll deliver Purim baskets, but every year we instead eat someone else’s Hamnentaschen and forget about the baskets until it is too late. Why is this year different from all other years? The Purim Surprise. This book, a gift from the PJ Library, is a favorite of The Spitfire and puts heavy emphasis on the gift baskets, AKA “Shalach Manot” (and variations thereof). Last month she started saving her candies from doctor visits, birthday parties and her wonderful piano teacher, for the shalach manot gifts she planned to give her friends. With that kind of advanced planning, I needed to be a little more on the ball, too. So, I bought some pastel chocolate rocks and went on a hunt for the perfect Hamentaschen recipe. 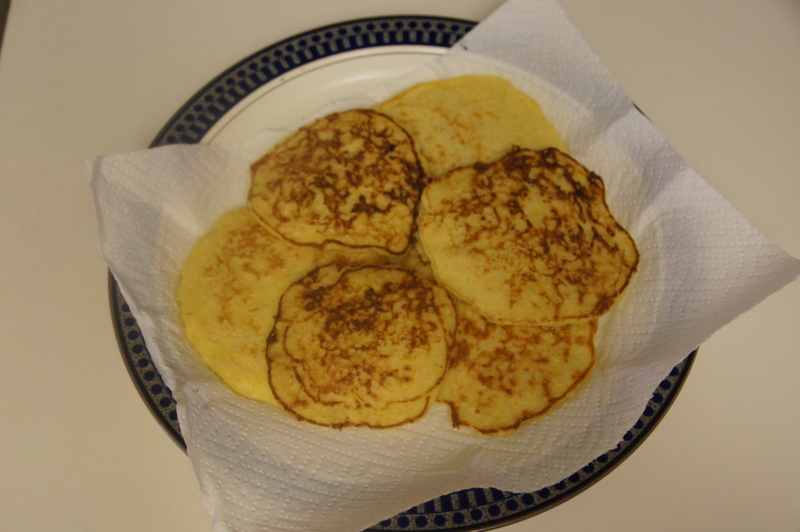 I tried a few that literally fell flat until I remembered that several year ago the PJ library had sent our family Joan Nathan’s Children’s Jewish Holiday Kitchen, a wonderful family cookbook with specific instructions on cooking and baking with kids. We put a few of the cookies in the gift bags, and took the rest to the Energizer Bunny’s pre-K class. These are so easy, and so delicious. 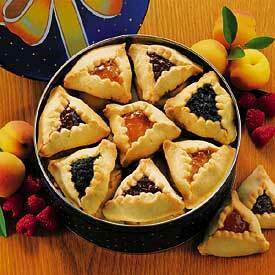 Don’t wait for next Purim to make them. These can be adapted to be kosher, as below. You can do each step by hand, but I use the food processor to make the dough. Add egg and continue creaming until smooth. Add milk or water and vanilla and mix. Sift flour and mix with rest of dough until a ball of dough is formed. Divide into 2 cylinders about 3 inches in diameter. Wrap each cylinder in cling wrap and refrigerate 3 hours or overnight. Using one cylinder at a time (keeping the rest in the fridge until needed) cut 1/8-inch slices and roll them out with a rolling pin. Place 1t filling in the center of each circle. Draw the edges up at 3 points to form a triangle around the filling and pinch together carefully. Place triangles on ungreased baking sheets (I used parchment paper—the filing tends to run) and bake 20 minutes, or until golden brown. We had friends coming over for a Friday night dinner, and I needed a meal I could prep in advance 100%. So, with grilling in mind, I had marinated chicken, watermelon chopped veggies in a ziploc and corn at the ready for the main meal. I forgot about dessert until it was too late—I no longer had time in the morning to bake and cool something. Luckily, I had all the ingredients I needed to prep a peanut butter pie recipe I’d clipped from Shape or Self magazine before the turn of the century. It had been almost as long since I’d made it last. Spitfire: I’m not sure about the cream cheese taste. Friend: I love the cream cheese taste! Spitfire: Yeah, I like the peanut butter and the crust. Friend: I love the crust! Spitfire: This is a weird dessert. I’ll take weird. As the Spitfire says, everyone is weird in their own way. The crust, FYI, is not the one from the recipe. I have never made a crumbled crust because I am perfectly happy to buy one. I used the same OREO crust as in our birthday ice cream cakes. This caused my children to believe it was an ice cream cake at first, but they managed to pick up the pieces of their shattered lives and eat the pie. You can scale the fat up or down in this version. Maybe it all depends on how much you think you deserve that peanut butter pie. 8-oz package light cream cheese (in this ingredient, don’t go fat free. Fat free cream cheese is the work of the devil). Gradually beat in condensed milk. Drizzle toping over pie. 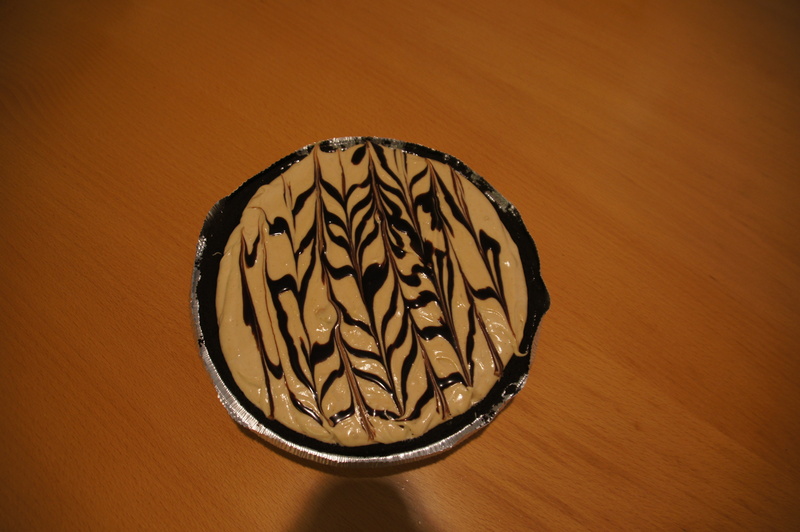 Use top of knife to swirl topping decoratively.